ARMA Media is looking for a talented junior video editor to join our team in Shanghai. He or she should be passionate about all facets of film production and especially the post-production phase. The candidate should have previous work experience and the technical skills to operate and troubleshoot an editing suite. •	At least 3 years experience in editing and post-production. •	Adobe Premier Pro. Adobe, After Effects, Adobe Photoshop a must. Final Cut a plus. •	Motion graphics and VF software knowledge a plus. •	Knowledge and experience in all phases and facets of a video production: scripting and storyboarding, mood board creation, pre production, production and post-production. •	Directing and Camera experience a plus. •	Proficient in English, Basic knowledge of Chinese a must. •	Outgoing and a good team player. 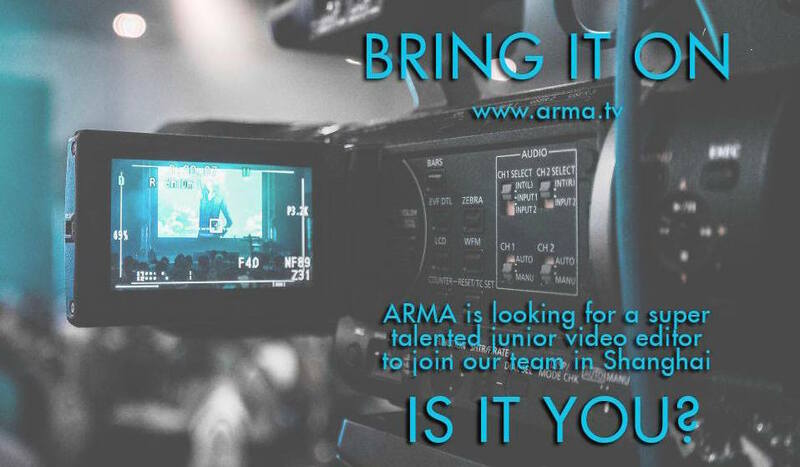 Please email your resume/CV and a minimum of 3 portfolio pieces to info@arma.tv. Please note Video Editor in message subject. Applicants must be legal to work in China – Chinese Nationals or meet requirements for work permit to be provided by ARMA Media.